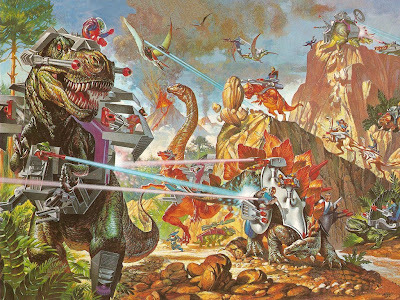 nerds of a feather, flock together: ALERT: Alien Dinosaurs to Conquer Earth by 2055! Noted Columbia University chemist Ronald Breslow recently deviated from the accepted parameters of academic discourse by writing something the media actually paid attention to. That is, at the end of a long and--presumably--dry paper about amino acids and such, Dr. Breslow informed us that there may be alien worlds out there populated by giant, super-smart Pterodactyls and T-Rexes. Is Dr. Breslow actually claiming these alien dinosaurs exist, or better yet, that they're actually on the way to conquer Earth as we speak? Unfortunately not. But I like to think these alien dinosaurs are smarter than we are, and as such, probably deployed Dr. Breslow in an ingenious double-bluff to catch us napping. In fact, they may be on the way here as we speak. They probably also wear lasers on their backs and talk sassy.